Kokomo City Hall is located at 100 South Union Street, Kokomo, IN 46901; phone: 765-456-7370. 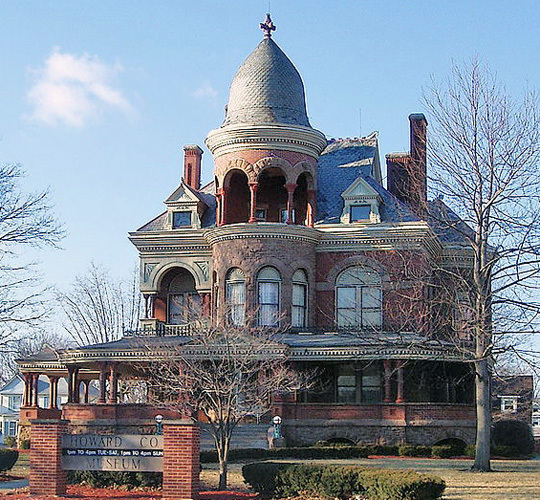 Photo: Seiberling Mansion, ca. 1889, 1200 West Sycamore Street, Kokomo, IN. Listed on the National Register of Historic Places in 1971. Photographed by User:Ross Pierce (own work), 2008, [cc0-by-1.0 (creativecommons.org/publicdomain/zero/1.0/deed.en], via Wikimedia Commons, accessed November, 2013. Kokomo, an industrial city and seat of Howard County, was laid out in 1844. The building of a railroad through the community in 1853 and the discovery of natural gas in 1886 brought many factories. Like most manufacturing centers its tempo is lively and it gives the impression of being a larger city than it actually is. Kokomo produces iron, steel, brass, farm machinery, automobile parts, radioes, stoves, furnaces, canned goods, women's clothing and many other articles. At the entrance of Pioneer Cemetery, intersection of Wildcat Creek and Purdue Street, is a Monument to Kokomo, the Miami Indian chief for whom the city was named. In the cemetery are buried many of Howard County's pioneers and Civil War soldiers. Indiana Writers' Project, Federal Works Agency, Works Progress Administration, Indiana: A Guide to the Hoosier State, American Guide Series, 1941, Department of Public Relations, Indiana State Teachers College.